The Charlie Banana® 2-in-1 Swim Diaper & Training Pants have a waterproof outer layer and a soft organic cotton interior lining which is gentle against your baby's skin. They make ideal training pants when potty training a child because of the trim fit, easy removal, and a fine absorbent layer to minimize little accidents. This is the perfect alternative to ugly, bulky, wasteful disposable baby swim diapers that don't retain anything. 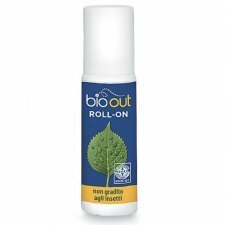 Roll-on refreshing and soothing, for a fresh and delicately scented. It contains natural substances whose scent is not like insects. Use: Apply the product on the parties concerned and massage gently. Warning: Avoid contact with eyes and mucous membranes. Keep out of reach of children. Tested to be 100% effective against mosquito bites (clinically tested to provide 100% protection against Aedes aegypti - Zika carrying, and Anopheles gambiae - malaria carrying mosquitoes for 4 hours). 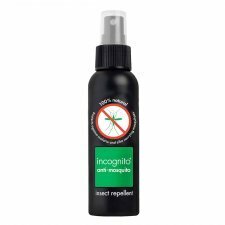 This award-winning insect repellent spray contains no DEET or other harmful pesticides. 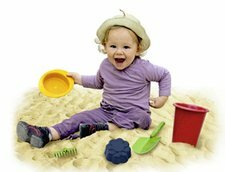 incognito® is certified as 100% natural and can be used by all the family including young babies from 6 months onwards. Packed full of natural and organic ingredients, the active ingredient is PMD. PMD is NHS and Public Health England approved, and recommended for high-risk areas for mosquito-borne diseases. incognito® is fully tested and meets UK safety and efficacy standards for providing protection against malaria and Zika carrying mosquitoes. Re-apply to pulse points frequently for maximum protection, suitable for all the family including children from 6 months onward. Approved by the Soil Association as COSMOS Natural, the ingredients inside the Spray have been rigorously tested; there is no GM, and we never test on animals. A COSMOS Natural standard also ensures that both harmful environmental effects and waste production are minimised. 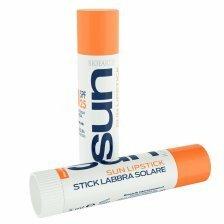 In addition, the bottle is made from sugarcane plastic which has a positive carbon footprint and is 100% recyclable! 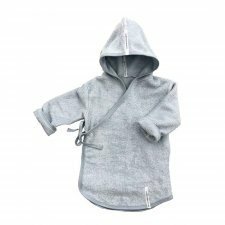 Bath towel that our little ones can wear: In this fluffy poncho made of 100% terry cloth, they can sit around, lay down or play, wrapped up and it won't open up in the front like a normal terry robe. Available colours: natural/grey striped or natural/blue striped. One size from 1 to 3 years. Size: 56x75 cm, hood excluded. Soft after bath poncho with hood. Side closer with 1 popper. Made of 100% organic bamboo terry. Soft after bathrobe with hood. Side kimono closure. 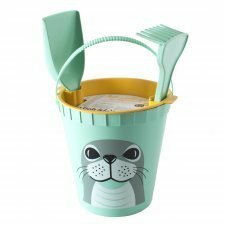 Beach kit (bucket, sieve, shovel and rake) Mibo seal in Algoblend®. Made in France from brown seaweeds collected in the west of France, brittany. An alternative to the all plastic. Algoblend® is classified in new generation bioplastic category made of innovative 100 % natural components. L’Algoblend is a BPA free material, reducing thus all the risks linked to these endocrine disruptors. Our partner Algopack is a leader in the blue chemistry sector with all the Patents and Trademarks. 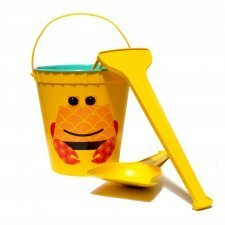 Beach tool set in bioplastic. Ecology at the beach! 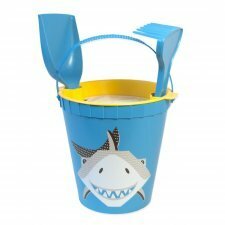 A colored set made ​​from renewable raw materials (cellulose acetate), an ecological and healthy toy, a nice alternative to petroleum-based products or traditional plastic toys. 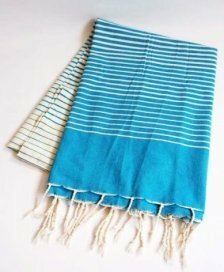 Beach towel in 100% fair trade cotton. Available colors: orange, blue or green. 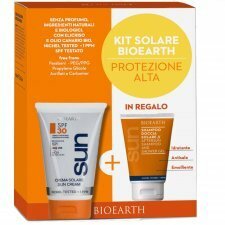 1 Sun body cream SPF 30, 1 aftersun milk and 1 after sun shower and shampoo gel. 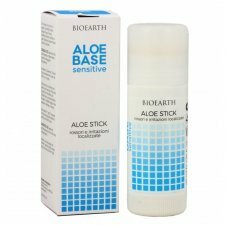 The product contains gentle botanical ingredients. It defends from UVA/UVB rays and helps prevent erythema and skin reddening. It is indicated fro clear and sensitive skin. 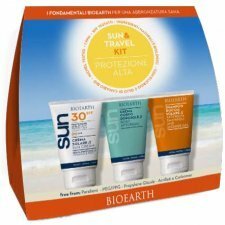 1 Sun body cream SPF 30 and 1 after sun shower and shampoo gel. 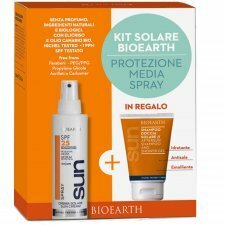 1 Sun body cream spray SPF 25 and 1 after sun shower and shampoo gel. 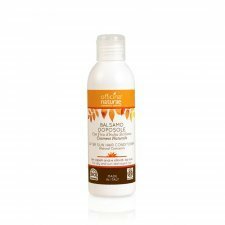 A very high protection sun cream formulated with natural and organic ingredients. Indicated for infants, children and adults with sensitive, very light skin complexion and for extreme sun exposure. 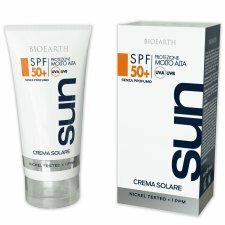 Provides a wide spectrum shield against UVB/UVA rays. 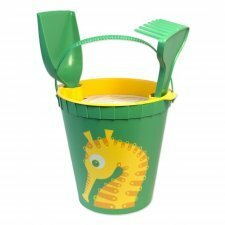 Size: 150 ml - PAO 12 months.